A terrifying scene unfolded around 2:45 PM on October 6, 2009, in Hillsboro, Oregon, when a 50-year-old driver slumped over the wheel, unconscious, while driving his car on NW Cornelius Pass Road near Evergreen Parkway. With the driver’s foot still on the accelerator, his panic-stricken passenger grabbed the wheel and tried to steer, but the car careened through traffic, picking up speed as it went. According to The Oregonian, the passenger tried desperately to get control of the wheel and apply the emergency brake, but was unable to control the speeding vehicle. Locked in a turn and reaching speeds up to 65 mph, the car circled uncontrollably through the busy intersection at Evergreen Road, smashing into four other vehicles. Five people were injured in the crash, two seriously, but, miraculously, no one was killed and none of the injuries was life-threatening. The vehicle, a Honda Pilot, first rear-ended a Chrysler Pacifica at about 40 mph, then continued to accelerate and veered into the median at about 60 mph. At that point, the van became slightly airborne and crash-landed into oncoming traffic at Imbrie drive, in front of McMenamin’s Cornelius Pass Roadhouse. 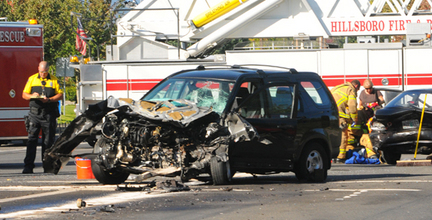 The van then hit a Ford Taurus, a Nissan truck, and a Hyundai Accent coupe. The van’s driver and passenger were taken by ambulance to Legacy Emanuel Medical Center with serious but non-life-threatening injuries. The drivers of the Taurus, Nissan, and Hyundai were transported to Legacy Emanuel Medical Center and Tuality Community Hospital with non-life-threatening injuries. The driver of the Chrysler was injured less seriously, and was treated at Tuality. Hillsboro Fire & Rescue responded and treated victims at the scene. The crash closed NW Cornelius Pass Road and NW Imbrie for approximately 90 minutes. When a driver passes out due to a medical condition, it can be difficult to figure out whose fault it is. You may be surprised to read this from a personal injury attorney, but it may be nobody’s fault. A freak accident is what we call an “act of God,” and nobody gets blamed. There’s no way to know what actually happened to cause this tragedy without further investigation. When people are hurt in situations like this, they first look to the police for answers, and then typically they look to a personal injury lawyer, who would perform a private investigation and get answers.